They woke me up again. My daily slumber, disturbed by the sound of bones and expensive gems breaking. I thought it was fixed, but those flying boats are raining men again. I better check the tickets and move them, before… bad, bad Newt! Leave the poor man alone! They really shouldn’t be jumping. I should probably learn navigation next. It would be nice to spend more time on the water, but those islands are so confusing and being cursed into this male body does not really help with asking for directions when lost. Plans for today: start hiding crispy beehive cookies in moved Shudad sets in preparation for Halloween. They’ll either get a nice treat, or a bunch of angry bees buzzing around their bottom. RNG is such a curious mechanic. What a strange note to find...and beyond that, who nails a note to a tree in the middle of the woods? "Rng " sounds strange, probably something better left forgotten... sounds like I should stay away from any new armor for awhile with a prankster on the lose. ‘All GMs are Warriors’, he said to me on my first day. ‘You mean we guard the realms of players, fighting off all the bugs, goldsellers and cheaters?’ - I blurted out enthusiastically. Foolishly. GM Tokaji just smiled at me, the weight of wisdom is his eyes nesting in thick wrinkles underneath them as he spoke: ‘No, child. Well, maybe that too. But mostly it’s because the Uniform only fits the Warriors.’. I was disappointed. The Witch inside me stirred, uncomfortable, aware of what’s to come. She always knew all implications before I would. And she was fuming. It’s interesting what memories float to the top as we begin to resurface from a dream. They coat our ethereal bodies - like tar, grasping with strong, wreathing tentacles, and some even try to pull us back down, below. My dreams recently were heavy, still clung to my eyelids as my three behemoths would purr and demand attention. ‘I’ll find a way to restore us all, one day...’ I promised them again. The Witch hissed; it’s going to be yet another day full of nasty headaches. When I arrived at the office, the boxes were already piling up, ready to be sent.’I half expected you lot to build a fort with those’, I joked and sighed with disapproval upon noticing it never occurred to them. ‘Well, at least let’s make sure all those coupon packs arrive in their mailboxes before…’ I stopped, as the packages started to shimmer and vanish in thin air. Devs do have their magic tricks, you’ve got to give it to them. And the mail always gets there, eventually. When I first saw this post I was thinking the same! Death Note ftw! The bell rings again, this time for the Abandoned Monastery. This place seems to be notorious for claiming adventurers and the wretched ladder just refuses to stay in the right place. Ghosts, or pranksters? I materialise behind the slender Ranger and wrap my wings around her. Half a breath later we’re in Velia and the salty breeze carries a refreshing scent as she looks around dazed and slightly confused. They never get used to these travels. Each time I leave my notes for the wind to carry away, I wonder what happens to them. Can anyone actually find them, see them? In the realm full of players, teeming with life and movement, I sometimes find myself sneaking behind unsuspecting heroes too focused on their fight to pay attention to anything else. Do they know of Death? I have found you. Would you like a sweet lullaby? The reminiscence of a caress long gone, turned into dust fills the space behind my eyes. Fingers drowning in the soft, silky darkness, vibrating with the echo of pleasure. I shiver, on this last day of warmth and sun, as it ceases to triumph, mere moments before the mists roll in to coat everything in sticky silence. And yet my head explodes in a thousand screams, a cacophony of thoughts. ‘Your body remembers’, she whispers from deep within. Does it, though? The Witch stares at me carefully judging the situation, cocking her head - wary not to pull at the wrong string. ‘This is not even my skin anymore! I can’t stand the feel of it, how can you even…’; my words crumble to pieces as they crawl through my lips and dangle off the tip of my tongue, ready to fall into nothingness again. The reeds send a rustling whisper over the lake, brushed gently by the strokes of the wind. She stares at me, through me, at this moment lost in time - ‘yes, it is still our skin, even though they have branded us with their scarlet lies.’. Her rage burns like a pyre in the darkness, fuelled with sadness and disappointment. Her words bring back the images that cling to my fingers, cling to my blade. ‘He’s stuck for good’ - GM Dew’s hands stopped gesturing as she was beginning to accept defeat. ‘What are we going to do? We can’t just leave him like that...’; the creature was majestic, his great wings slowly batting the air were forcing the nearby trees to succumb to the blows of the wind. ‘Well, it’s not like he’s going to eat someone like this… or fly away with a horse’. She didn’t like my attempt to try and make light of the situation. ‘Damn, I should have taken those humour classes from GM Nevermore while I still could’, I muttered under my mask as she stared me down. As I was absent-mindedly flipping through the manual attached to my belt, ‘I suppose we could just summon another one?’ - I didn’t expect her to take this mad suggestion seriously, but she was already jumping around all excited - ‘Yes! That’s exactly what we’re going to do! And yes, you’re going to help me! No excuses.’. Summoning has never been an easy task. You need to have all the right ingredients, the spell has to be chanted properly, there’s no room for mistakes. You mustn’t rush. It’s interesting how much you can learn unexpectedly… Especially when your newly summoned Khalk appears in Valencia, looks around, and just flies away minding his own, ancient business. And doesn’t care about two GMs trying to stop him. As we were rushing through the Cyclops Land, all the sounds slowly muffled and eventually faded. My hands were not my own. My eyes blinked, but it wasn’t me closing them. ‘I shut my eyes and all the world drops dead’ - the whisper in my head was growing more impatient, louder, and more dangerous with each word. Like impending doom, marching through my head and out of my mouth, unstoppable. ‘I lift my lids and all is born again’. It wouldn’t stop, the more I tried to take back the reign of my body, the more I was being pulled back within. Suddenly, a firm and slightly painful grasp of my shoulder broke the charm, ‘are you alright?’, GM Dew’s concerned voice started to make it’s way through the fog in my mind. The last thing I saw before falling, was the second Khalk, still minding his very own business, returning to his rightful territory. I slid my hands out of the leather gloves and slowly cracked the knuckles, one by one. It was a calm, silent evening, and the setting sun was reflecting off the lake, illuminating the shore in dark reds. My fingers burrowed in the wet sand, its cold embrace slowly leeching the tiredness of the day away. I watched the lazy waves lick the shore, and my mind soon drifted towards deeper waters. She was sitting right next to me, in all her eternal beauty. Her long fingers slowly brushing the red curls. I stopped to think, were they always so vivid? The longer I’ve spent in this body, the harder it was to recall details. A thought in my mind tugged at the edge of my sleeve, demanding attention, trying to bring up something important. Another wave rolled over the sand, washing away the worries. The Witch smiled and rubbed the freckles on her nose. By the time I got back, the office was already in full alert. Threads and tickets were flooding in. I opened the box and walked by each desk, handing out the squidgy contents. CM Tytyes looked at me unimpressed; ‘just put it on already, it’s our own Red Nose Day’ - my firm tone finally convinced him - ‘...and don’t forget to donate!’. Enjoy today. Laugh with others. Help children. When things seem a bit too meta, go more meta. I materialise behind the slender Ranger and wrap my wings around her. Half a breath later we’re in Velia and the salty breeze carries a refreshing scent as she looks around dazed and slightly confused. They never get used to these travels. As a Ranger main this terrified me! Very nice stories overall, glad I found this thread. Thank you! I don’t remember when he actually started avoiding me. At first it was subtle - my black spirit stopped making the annoying noises. Then he wasn’t bothering me with all those errands he used to have for me all the time. And now he was even refusing to show up. No one has seen him in a while. I wonder what the wretched thing was up to this time. GM Vheena looked really worried, ‘what do you mean you can’t call your black spirit? That’s really bad!’. Then, mumbling something in French, she got back to braiding a wild horse’s tail. ‘Can we also make its hair white? You know how I like the white hair…’. It was hard to argue, the big red moon was reflecting off it beautifully. ‘Just hurry!’. I found myself wandering the Desert more often recently. Something deep within was just longing, pulling me towards it. This feeling of being incomplete, almost lonely. The Witch seemed to be focused on something else, her usual huffing and nagging to go different places has stopped. Like as if she wasn’t even there, but that was not the case. She was just ignoring me, or so I thought. And then, in the early morning, I found it. It looked like a shrine, like a gate. Pulsating, sparkling... breathing? It took me a while to realise the noise wasn’t coming from this thing - it was in my head. Cats arched their backs and hissed. And yet I ignored all the warning signs, I knew I was in the right place at last. At that point it was already too late. Last thing I remembered, was the whisper that escaped my mouth, ‘...it’s full of stars!’. And then everything exploded. Haha, really nice stuff. Should get more attention! totally enjoying these. reminds me of a localization expert I once knew. He had a knack for story telling. The ringing in my head felt almost like a vibration of my very essence. I finally dared to open my eyes - so very slowly. It was dark, but the ringing noise was slowly fading at least. Just in time to be replaced by wet, chewing sounds… and something dying. I’ve fumbled in my pockets for a small bottle of lantern oil, and with determination, forced my hands to stop shaking. Shy, little flame dancing around, licked the lantern glass and steadied itself. As the light started to spill all over the floor, I finally saw her. Crouched in the corner, holding darkness to her mouth. Her sharp teeth were tearing it apart - bite by bite - methodically and with rhythm. She knew I was watching, in terror of realisation she was simply devouring my black spirit, or what was left of it. The Witch licked her fingers and stretched slowly, like a cat. ‘You shouldn’t be here, not yet.’ - she couldn’t hide the disappointment. She walked up to me and stroked my arm, putting another spell on me with her silky voice: ‘but since you’ve seen it, I suppose I owe you a little explanation… for the loss.’. We walk the streets unseen, along other creatures lurking in the shadows. Sometimes we ruin their nasty plans - save an adventurer from loosing his lucky charm to an imp, or squish a spirit leech tracking down another Demibeast. I suppose the red moon makes all the weird things possible, but I didn’t expect this! She was sitting on a pumpkin, the red rays of light glowing warmly on her dark skin. I stopped and allowed myself to enjoy the look of a well matched costume on her lithe body, only to realise her eyes were fixated right at me. ‘You can see me?’, I nearly tore the mask off my face. Her cheeky smile had me grounded, ‘of course, come and sit down, I have candy!’. And suddenly all the worries felt completely irrelevant. 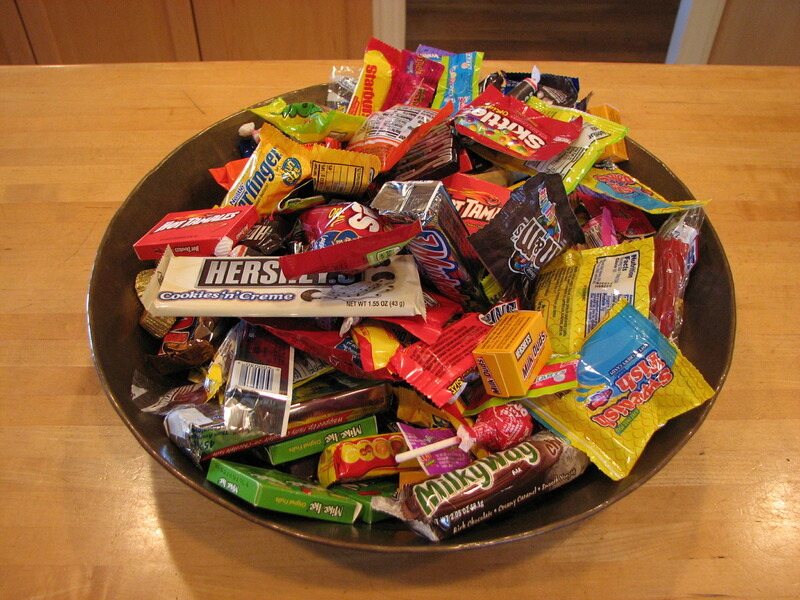 Can't forget your candy bowl! I'm waiting Salome, give us today's Death Notes! We were clearly underground. The air was thick and heavy, full of moisture and the scent of mold was beginning to creep down my throat. Pieces of crumbled walls were strewn all over the floor, decorated with weird, dusty mosaic. The Witch was talking to me, but I just couldn’t look at her. The long shadows cast by the little lantern sharpened her contours, and the flickering light kept twisting her visage, as if she was constantly changing. There was no beauty left to behold, just a hungry predator pacing back and forth the tomb. ‘This is not how I wanted this to unravel. Now you think I’m a bad person...’ - she sounded almost like a little girl who just broke her mother’s most prized crystal vase and was trying to avoid punishment. I took my mask off and rubbed my forehead. ‘Didn’t you just eat my companion? What do you even want from me now, I thought we had the Pact!’. I couldn’t decide whether her smile was mocking, or full of pity. ‘We still do, sweet girl. And we are both getting our share out of it, even if you can’t see it just yet.’. The bell wasn’t going to stop ringing, not with this urgency. I took a deep breath, unfolded my wings and materialised right beside his bed. With his face buried in his hands, he didn’t even notice me, not until his hawk screeched. He looked pained and worried. ‘I heed your call, tell me what bothers you so much, Wizard’ - he placed his shaking palm in my outstretched hand. I’ve closed my eyes to look through his, to spectate in his memory what exactly happened earlier in the day at the blacksmith’s. I could feel my face tense under the mask, but I had to see and hear it all, so nothing could cloud my judgement. I saw him being pushed, called horrible names just because his attackers had a bad day. His robe pulled so hard, it ripped open at the sleeve. His bullies had no mercy - they didn’t even spare his mother. That was too much. I withdrew from his mind. ‘Thank you for bringing this to my attention, be sure I’ll take care of it in accordance with our Codex’; I squeezed his hand gently, reassuringly. ‘I know this must have been a difficult experience, but it’s very important that incidents like this are reported. Tomorrow will be a better day…’. I found them at the tavern, gloating about their earlier ‘courage’. I made sure to spread my wings high and wide, so they covered the light coming from the chandelier behind me - and as the men suddenly fell silent, I began to recite from the manual. Once the sentence was heard, their faces slowly began to crack, reminding me of the little girl and the crystal vase. Breaking apart, their eyes held open in panic, hands grasping for help that would not come. My wings mashed the heavy tavern air, dispersing the last residue of the punished. Play by the rules, for if you break them, we will know. There is no place for abuse under our watch. 'I swear this job would be easier with a hammer', I muttered under the mask as I walked out. I stumble around the corner, disoriented from just having returned from raiding trade wagons and although the engagements only last seconds my entire body stays tense for many hrs after; something to do w/ dying but never being able to stay dead. Eyes blood-shot and body weighted with so much silver I can barley stand something grabs my eye. Pinned to a wall that Im certain Ive passed by many times; hangs a note a "Death Note" it would seem. Bracing my trembling body against the wall, I struggle to keep focus as I read having stopped blinking do to the agonizing pain each blink brings me. Having reached the end, I gather myself and start again up the street toward my residence. But as I do, I find myself looking back over my shoulder at that note pinned to a wall smirking as if it were a dear friend "Well Played...most certainly,Well played."